Lucknow Sep 15 (IANS) Senior Samajwadi Party (SP) leader and former UP Minister Shivpal Singh Yadav who recently floated his own outfit by the name of Samajwadi Secular Mocha (SSM) on Saturday said that his party would like to field Mulayam Singh Yadav on party ticket as the Lok Sabha candidate from Mainpuri. Talking to reporters in the state capital Yadav said he would make the offer to his elder brother Mulayam and even like him to become the President of the SSM. "We will very much like to field him as our candidate from Mainpuri rest is on him " Shivpal said while reiterating that all doors of rapprochement with the SP are now "shut for ever". The one-time number two in the SP has already announced that his Front would contest all the 80 Lok Sabha seats in the 2019 general elections. 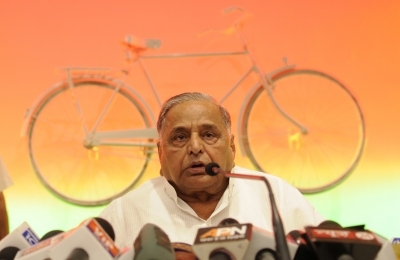 He also added that even if Mulayam wants to contest on the ticket of any other party the SSM would extend support to him. The former Minister also clarified that he took the step to form his own outfit after the blessings of Mulayam Singh Yadav and added that more and more SP leaders legislators and workers were tilting towards him and would soon join the Front formally. Yadav however ruled out any truck with the Bharatiya Janata Party (BJP) as was being rumoured but added that he is open for alliances with regional parties. He also dropped enough indications that his political war with his estranged nephew Akhilesh Yadav is now set in stone. When asked that he has removed the SP flag from his cars and whether this meant that he is also on way to resigning from his Jaswantnagar Assembly seat he answered in the negative. "I have neither quit from SP nor from my legislatorship. If they want they can expel me " he said combatively.